"Your pain is the breaking of the shell that encloses your understanding." 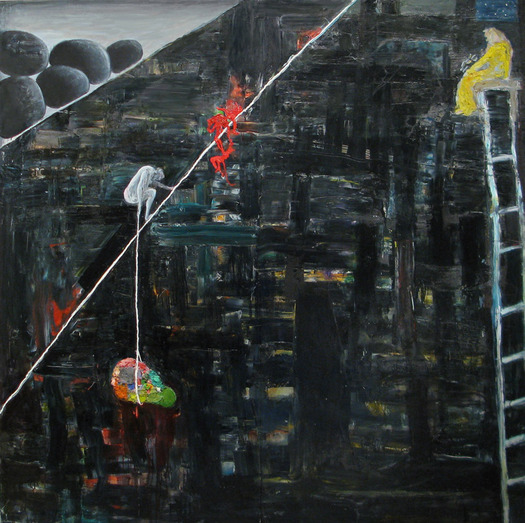 Artist Brenda Goodman paints to open up difficult emotions and see what can be done with them. The vulnerability of her approach is her strength as an artist, and what makes her different. " So much contemporary painting is not open," Goodman told David Brody in an interview. "You know, it's like a wall -- you can't penetrate it." Goodman, who has painted for over 50 years, surrenders to the act of painting itself, and lets the emotions -- however difficult they may be -- bloom directly from her unconscious. Her work is never precious, since she observes that it is often the "precious area that's keeping the painting from being finished." Over the years she has learned to trust that balance and resolution will indeed appear if you let them. "Through the years I've gone from taking days or weeks to let something go... to minutes," Goodman notes. "To me, this is one of the most spiritual acts of painting." The works on view in Goodman's solo show at John Davis Gallery demonstrate her mastery of a personal language of emotion. In dark-walled settings, themes of entrapment, fear, challenge, and mortality are balanced by hints of joy, passion, and peace. Goodman's work has a degree of emotional intelligence that is rare and moving. In the interview below I ask her about her background, her work, and specific works in her new show. JS: What can you tell me about your background and how it shaped you as an artist? BG: I was born in Detroit, Michigan 69 years ago and and moved to New York in 1976. Detroit was a tough city and I was tough as well. But I had access to a really good art school -- The Society of Arts and Crafts, now the Center for Creative Studies -- and the Detroit Institute of Arts has a great collection. Between the two I had a very solid foundation. I think I was born with a strong core. I'm persevering and determined and don't give up in the face of the many difficult and painful parts of my life. I have very deep feelings on a conscious and unconscious level that come through in my painting. My work has always been personal, from my heart, honest and authentic. As a person I say what I feel honestly and directly. It's not the easiest way to go through life because I don't hide my feelings well but I believe I come from the same authentic place as my paintings do. JS: I find your paintings emotionally acute. How are you able to make your paintings transmit powerful emotions so directly? 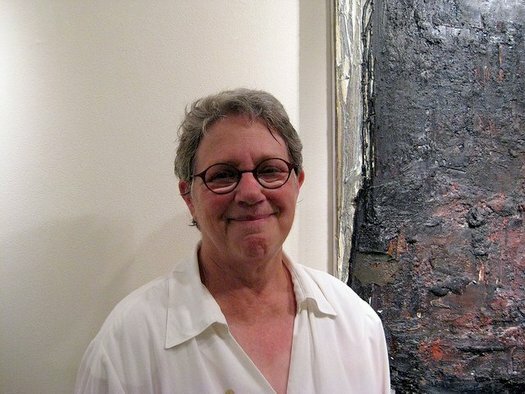 BG: There are two aspects of my practice as a painter that have worked positively for me. The first is my passion for oil paint that started 50 years ago. I have spent all these years experimenting with every possible way I could use oil paint. Through the years I have had many, many techniques at my disposal. The second is the way I'm able to take something very personal in my life, something quite specific, and use it as a starting place to arrive at something much more universal that the viewer can tap into. And why it works in such a strong way for me is because all those years of honing my techniques allows the paint to become the emotion I want to express. JS: Can you tell me about some of the specific emotions suggested by your recent paintings? BG: The newest paintings speak to the emotions I am concerned with now. As I wrote in my artist statement for the show: "The new work is about duality: the delicate balance between joy and suffering, hope and disappointment, life and death, struggle and release, perseverance and futility." 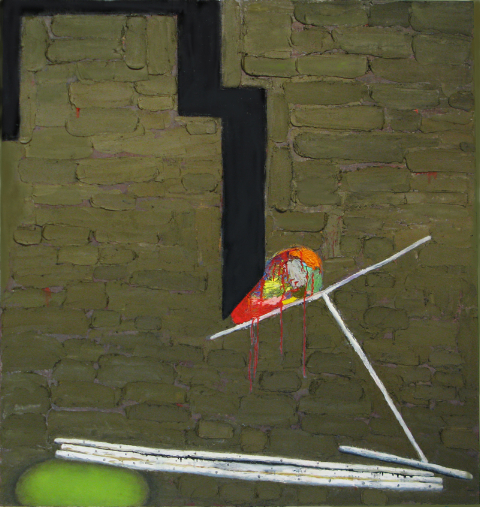 Brenda Goodman, "Untitled A1," 2012, oil on wood, 72 x 72 inches Untitled A1: This painting I feel communicates hope and despair: the tension of the shapes on the high wire. 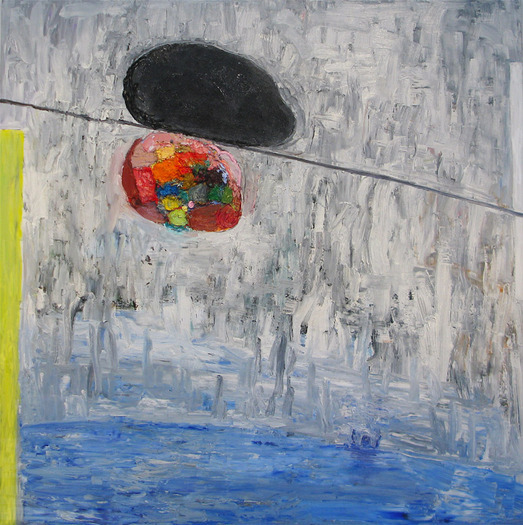 The bright colored shape in all 4 paintings is life with all that it encompasses. Joy, passion, painting, sadness, aloneness, mortality (which at 69 means no endless possibilities anymore) and whatever else this shape represents to the viewer. Brenda Goodman, "Untitled B2," 2012, oil on wood, 72 x 72 inches Untitled B2: This painting started specifically in wanting to communicate the struggle that life is: the obstacles and demons I encounter as I struggle to find peace within me. 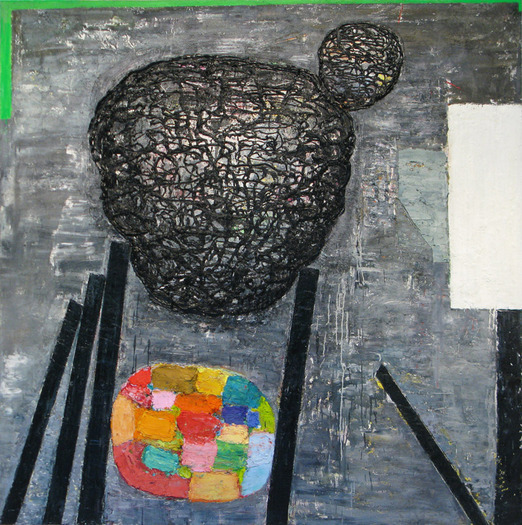 Brenda Goodman, "Untitled C3," 2012, oil on wood, 72 x 72 inches Untitled C3: This painting evokes tension, and anxiety. The heightened anxiety is from trying to keep the dark forces from breaking through the barriers and hurting the life shape. Brenda Goodman, "Untitled D4," 2012, oil on wood, 72 x 68 inches Untitled D4: This painting feels vulnerable, threatened and tense. It started off as a very different painting but my deeper knowing moved the paint many times until that black vertical emerged and the painting became realized. If my paintings didn't tap that mysterious place of a deep knowing I would feel less successful as an artist because then they would just speak to me and not those who view them. For me the most satisfying way of working is the combination of the abstract and the figure. The freedom of abstraction and the emotions that the figure (or an abstract shape representing a figure) can carry are very satisfying to me.